Here's another exciting post to announce the Week 4 Winner for our Plank & Power Fitness Challenge. It's been a fun and HARD one for most of us ... Make sure to join our group to get the announcement for our next fitness challenge and to congratulate our winners!!! Cause everyone who participated is a plank champ for sure ... We'd love to have you join the fun. 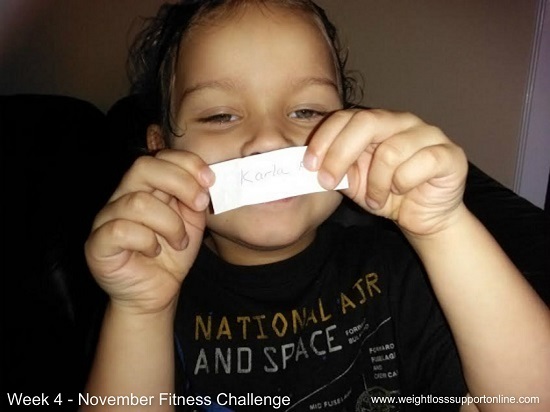 Karla K ... She is our week 4 winner. WOO HOO!!! She has the choice of either a bottle of Skinny Fiber, Ageless Anti-Aging Serum or Amazon Gift Card towards something that will help their health and fitness. I'll update this post with which gift she selects this time. She won in a different challenge, a while ago, and got the gift card for compression socks. Anywhoo, congrats to Karla for winning. Also, a huge THANKS to my son for helping with this challenge and all of our group members who participated this month. We have just a little over 3 weeks until Christmas and 4 weeks until New Year's Day. Don't wait too much longer to order healthy gifts for your family or yourself this holiday season; especially for the Skinny Fiber Max because it is on pre-order for shipments starting the beginning of this month and is already very popular for Skinny Fiber customers wanting to try it to have the combined probiotic, prebiotic and fat burning ingredients. If you have high blood pressure and / or have been taking Skinny Fiber successfully, stick with it and order today, so you don't have to go without. CLICK HERE to learn more about Skinny Body Max (powerful new product)! CLICK HERE to learn more about all natural Skinny Fiber (stimulant free)! CLICK HERE to listen to the information on Ageless Anti-Aging Serum. FYI - You can take HiBurn8 with Skinny Fiber or Skinny Body Max for even more help. Don't forget to join our WEIGHT LOSS SUPPORT GROUP TODAY, TOO!! !